Hardwoods, especially elm, cottonwood, alder, and oak. Usually on a stump or log. This large, common, widespread, fleshy, bracket (shelf-like) fungus. It is usually saprobic, on decaying stumps and logs, but is sometimes parasitic, on the sides of injured trees. This mushroom is found usually on hardwoods, especially elm, cottonwood, alder, and oak. It is rarely found on conifers. It usually appears as overlapping shelves on a log or stump, sometimes on a live tree. It enters the tree through a wound and infects the wood causing white rot. It first appears in the fall after a heavy rain. There is usually no stalk unless it is growing on top of a log. If there is a stalk, it is short, ¼″ to 1½″ long, thick, and off-center or even laterally attached. If growing on top of a log the stem may be centrally attached. The cap is oyster- or fan-shaped and 1½″ to 8″ in diameter. When young it is convex and the margin is rolled inward. As it matures it becomes flat or occasionally funnel shaped. The upper surface is smooth and variable in color; white to gray, grayish-brown, or tan, sometimes dark brown. When wet it is somewhat slippery or greasy but not slimy or sticky. The margins are often wavy or lobed. The flesh is thick, white, and firm but soft. It is edible and has a mild odor and taste. The gills are broad, close to well-spaced, and run down the stalk if there is one (decurrent). They are white or tinged gray, becoming tinged yellow on older specimens. The spore print is whitish, pale lilac, or gray. The genus Pleurotus was formerly placed in the family Tricholomataceae. Molecular phylogenetic analysis resulted in several families, including Pleurotaceae, being separated from Tricholomataceae by 2006. It's growing in my backyard on a berm that is probably has construction materials and tree remnants under the sod from when the house was built in 1997. If someone would like to "harvest" it, contact me at vjthomas66@gmail.com. It is growing out of a dead elm or oak. Looks like an oyster. Please comment, share, like and subscribe: https://www.youtube.com/user/Earthwal... A nice rosette of edible Wild Summer Oyster Mushrooms, found while Wild Mushroom Hunting in Warren county Ohio. Start learning mushroom identification here. Organic Oyster (Pleurotus ostreatus) mushrooms discovered by Michael on a rotting maple log in Maine. Brief description of how to key out this species. Never eat a mushroom you haven't I.D. 100%. Some species can kill. 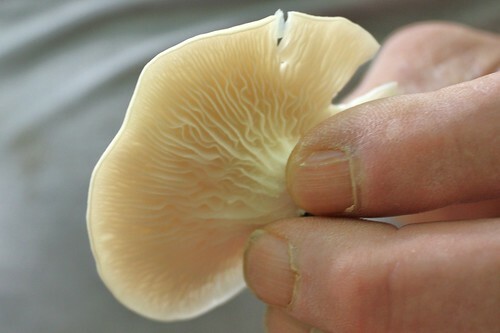 "Pleurotus means "side ear", from Greek πλευρή (pleurē), "side. Get a good field guide and study it. Be safe.